Look at my new main image! Cute isn't it? ^_^ I love that site! Scroll down to see the link to the new main Page! Please sign my Guestbook! Hi! 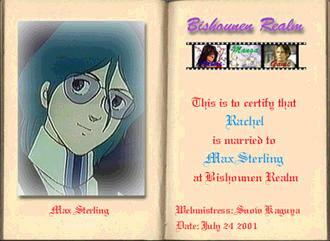 I'm Rachel W., also known as Xellos17 or Alexander Hiroshi. I welcome you to my art site, and hope you enjoy your stay. If your an artist who wants art up on the site, please e-mail me and let me know where I can find the art, or e-mail the pics to me. I accept .ZIP files. ^_^ Enjoy your stay! Wanna know when I update? The join my Mailing List! ~*I Support Miaka & Hotohori! Click Below to Enter the New Main Page!